UofL’s commitment to student achievement is evidenced by processes that have been developed and implemented to collect, analyze, and use data from the entire academic lifespan of students at the university. From pre-enrollment variables to feedback collected from alumni, UofL uses student data deliberately to measure student achievement, set student achievement metric goals, and gauge the success of student-focused/intentional programming when compared to similar institutions. The institutional focus on our entering student profile has been one of the key factors in the increase in our fall-to-fall retention and 6-year graduation rates. 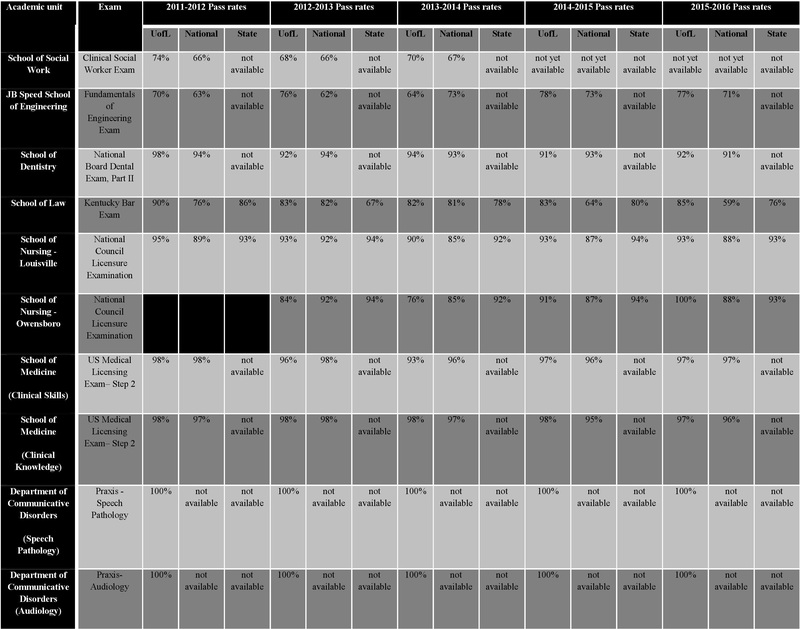 The table below details a subset of the first-time student profile for fall 2010 through fall 2015. UofL’s 1988 entering Graduation Rate Survey cohort had a 6-year graduation rate of 29.8%. 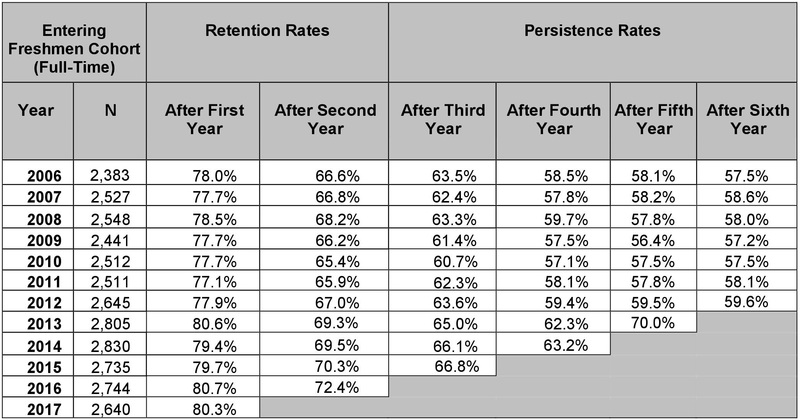 The entering 2008 GRS cohort had a 6-year graduation rate of 53.6%. The 6-year graduation rate for the 2009 GRS cohort is 52.9%. Therefore, UofL’s 6-year graduation rate has increased by 23.8 percentage points over the past 20 years. The university remains committed to increasing the 6-year graduation rate to those rates achieved by other doctoral/research institutions as evidenced by the established metric of the 2020 Plan. In addition to increasing the 6-year graduation rate, UofL has continued to grow the number of undergraduate degrees which remains a continued priority in keeping with the university’s mission of being a metropolitan research institution and also the Louisville metro region’s 55K initiative. Consortial Agreements – are contracts that allow academic programs to offer courses/programs off-site, bring in students from other institutions (dual/joint degrees), and students to perform clinical work at off-site locations. These agreements can include CPE, the military, educational institutions and private entities that wish to interact with the university to accomplish a specific agreed upon goal. The list of consorital agreements provides links to each unit’s website with more information about the program offering.